Tis the season . . . for baking cookies. 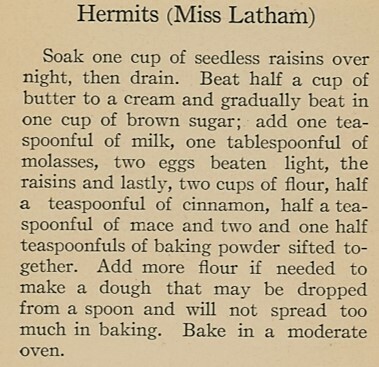 Old-fashioned, traditional cookies are my favorite, so I was thrilled to find a hundred-year-old recipe for Hermits. Hermits are a soft, spicy, raisin cookie. They have been around a long time so there are lots of variations. This recipe was for the traditional drop cookie version. The Hermits were delightful. They had a lovely texture and the right amount of chewiness. The old-fashioned goodness of the Hermits was enhanced by just the right amount of cinnamon and mace, and a hint of molasses. The recipe was easy to make–and would be a perfect addition to a holiday cookie tray. Preheat oven to 375° F. Put butter in a large mixing bowl, and stir (cream) until smooth; then stir in the brown sugar. Stir in milk, molasses, eggs, cinnamon, mace, and baking powder. Add flour, and stir until all ingredients are combined. Add raisins, and stir gently to distribute the raisins throughout the dough. Drop rounded teaspoons about 2 inches apart on a lightly greased baking sheet. Bake 10-12 minutes, or until lightly browned. Posted on December 4, 2016 December 4, 2016 by SherylPosted in FoodTagged cookies, recipe. Sounds delicious Are there any alternatives to using mace? Nutmeg could be substituted for the mace. In general these two spices are interchangeable. Nutmeg and mace are both from the same plant. Mace is the vein-like threads that cover the fruit; nutmeg is the kernel inside the seed. Mace was very popular a hundred years ago, and it is often called for in old recipes; whereas nutmeg is more popular today. In my opinion mace is a bit spicier than nutmeg, but there really isn’t much difference. I had no idea what mace was before this. Thank you. When I was a little girl, my gram made molasses hermits that were drop cookies, similar to your recipe. I had not been able to duplicate them, but will try this recipe. Maybe it is the mace that makes the difference. They look delicious! They were yummy. This recipe is definitely a keeper and one that I plan to make again. I think that you’d like it. Your grandmother may have used mace. I often see it listed in old recipes. Mace has a nuanced difference in taste from nutmeg that I really like. If you make this recipe, you’ll have to let us know how it compares to the cookies you remember. Sheryl, I did make your recipe and the cookies are delicious with a lot of flavor and a nice texture. I especially like it as an afternoon treat with a cup of hot tea. My gram’s cookies seemed to have more molasses flavor. I subsequently found a recipe for Molasses Drop Cookies that uses 1 1/2 cups molasses so I will try that recipe to see if that is closer to my grandmother’s cookies. 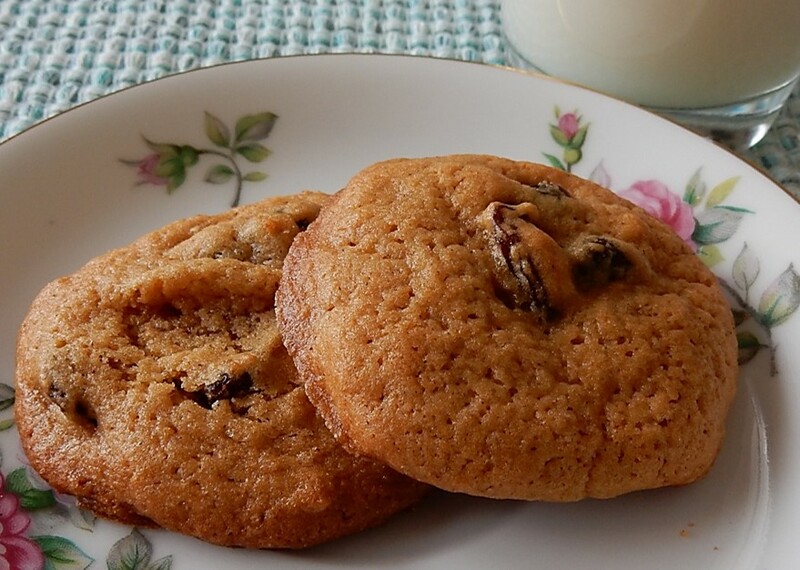 It’s nice to hear that that the cookies turned out well when you made them- though it’s too bad that this recipe didn’t replicate your grandmother’s cookies. I’ll keep my fingers crossed that the recipe you found makes cookies like the ones you remember. mmm. . . I like your suggestion. It would be a wonderful way to really update this recipe. The Hermits aren’t spongy-but they definitely are puffy and soft. I think that you’re right that the relatively large amount of baking powder called for in the recipe made them puffier than many modern cookies. Over the past few years I’ve found that many old-time cookie recipes – sugar, molasses, chocolate chip, etc.- are for softer cookies than is typical today. Preferences must have changed across the years. I might just try these. I’m a little behind on Christmas cookie making. I think that you’d be pleased with these cookies. They were tasty and easy to make. I just might add these to the cookie Christmas list! Wish I had one now to go with my coffee! I know from personal experience that they’re lovely with coffee. The ones I made went very quickly, and I’m thinking of making another batch when I do my main Christmas baking. I have never heard of hermits before, even though they’ve been around for 100 years. They sound delicious! You may have had them and not known the name of them. I have memories of Hermits often being on trays of Christmas cookies when I was child – but I didn’t know their name until recently. Love the recipe and how they cookies look. Definitely tempted to try them. I wonder if you had a reason for not soaking the raisins as the old recipe suggest? Were they drier then? Good question, I’m glad you asked – I intended to add a note about why I didn’t soak the raisins at the end of my post, but I obviously forgot. As you suggested, raisins were much drier a hundred years ago than what they typically are now. Modern methods for processing and packaging raisins result in much moister raisins, so I didn’t think that they needed to be soaked. I figured that was the reason. Soaking the raisins in alcohol would add a nice dimension to this recipe. Another good old recipe. It never feels boring to try these classics. I have not thought of hermit cookies in years! Thanks for the memories. I may have to make some with your recipe. I will be making mincemeat cookies this week. I’m glad this post brought back some good memories. I hadn’t thought of mincemeat cookies in years until you mentioned them. They’re another wonderful classic cookie. Thanks for sharing the link. This version of Hermits look wonderful. It’s really interesting how Hermits can be made in different shapes. The process you use to create Hermit bars makes a lovely cookie. I love these cookies. Made them all the time when growing up. This is an entirely new recipe to me. I would love to try them but I have yet to find really nice molasses here. What brand do you use? I used Grandma’s Molasses. It’s a brand that’s commonly sold in supermarkets around here. I don’t have a strong opinion about whether it’s any better than other brands, but it worked nicely in this recipe. I seem to remember using that brand when I lived in the US. Scrumptious photo! I’m not a big fan of raisins cooked into food . . . but other than that, these sound great! If you don’t like raisins, this may not be the recipe for you – though I suppose that you could leave the raisins out and have a nice spice cookie. What a sweet story about your grandmother when she was in the nursing home! Even though she had a disability, she was still trying to take care of her loved ones and wanted them to have a tasty treat. This is a great addition to my holiday cookie tray. My grandmother used to make a hermit cake at Christmas. I wonder if these cookies are similar? I think that you’ll enjoy these cookies. I’m not sure about the Hermit Cake- though it may be similar. There are a lot of variations to Hermit Cookies, including drop cookies, bars, and logs. Some of the logs are rather large and almost cake-like. I don’t think I’ve ever eaten hermits before. Though the cookies themselves look delicious, I’m not a fan of raisins. What would you suggest for a substitute? hmm. . . I think that walnuts might be nice in this cookie, or I could also see just skipping the raisins. Hmmm, I like hermits. This is pretty similar to an old recipe I used to make often–easy and goof proof! You’ll have to let us know how they turn out. Readers always find it helpful to read about others’ experiences with a recipe. I will take,pics and link to your blog! It was fun to see how the cookies turned out. I’m glad they turned out well. Off subject But, I have shelves of older and aging cook books I need to give away. Where, how, all replaced with new shiny ones. What would you do? hmm. . . I’d probably ask my children and other family members if they wanted any of the cookbooks, and then give the remainder to the library so that they could sell them at one of the used book sale fundraisers they periodically hold. Your question reminds me that over the years I’ve occasionally gone through my cookbook collection and sorted them into two groups – those that I’ve made at least one recipe out of and those which I’ve never made any recipes from. I’m always surprised by how many beautiful books I managed to accumulate that did not have a single recipe that motivated me to actually make it. I then give away the books I’ve never used and end up with a more manageable group of cookbooks. It’s wonderful to hear that you liked them. Merry Christmas! I think my grandmother made these! I will make them for Christmas. Thanks for posting! I think that you’ll like them. They are a lovely old-fashioned cookie.